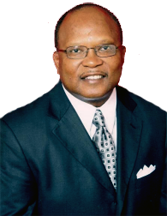 A native of western Pennsylvania, Bishop Edwin Bass is the 8th of ten children born to the late Bishop Joseph E. Bass, Sr. and the late Missionary Mary V. Bass. Along with Bishop Bass, his wife, daughter, maternal grandfather, father, mother, four brothers, one sister, three nephews and two nieces comprise a historical ministerial lineage with over 400 years of combined service in the Church of God in Christ. Bishop Bass is an alumnus of Colgate University in Hamilton, New York. Also, as a foreign exchange student, he attended Panjab University in Chandigarh, India. In the secular world, he served as Senior Vice President of Sales and Marketing for Blue Cross Blue Shield.